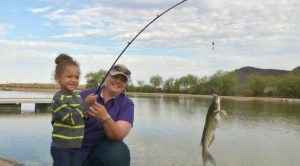 During Arizona Game and Fish Department free fishing clinics, loaner rods are provided, bait is free, and no license is required to those who register during event hours. For more information on the following events, please contact the Sport Fishing Education Program at (623) 236-7240. July 7-8 — Women’s Only Fly Fishing Clinic, instruction Friday evening at the Pinetop Regional Office, Saturday morning at Silver Creek outside Show Low (pre-registration required). Free fishing clinics, loaner rods are provided, bait is free, and no license is required to those who register during event hours. No events scheduled. Thanks to all who came out for the April 22 “hook to plate” event at Silverbell Lake.